Tecno Camon X Pro incorporates eccentric features good enough to magnetise your willingness to abandon your current phone and immediately make an order for it. That might sound overemphasised, but it's a reflection of what to expect should it become your device. The key features such as camera, Operating System, internet connections, security, smartness, speed, and display have been perfectly combined to deliver essence and maintain users' smartness. A whopping 24 MP front camera dual flash is rightly positioned to capture your glorious moments at an unrivalled quality. I bet it, social media enthusiasts and Selfie 'fans' will troop into Tecno's office to deliver their appreciation for this product. The front camera integrates a dual brightness adjustable flash that allows you to maintain the brightness of the photos you take irrespective of the environment. You can capture selfies or groupfies with excellent Bokeh effects to add flair and fun to the photos you take. If there are features you frown at, then the 16 MP rear camera perfectly offers compensation. Whether you are in need of professional photos or just capturing the fun of it, Tecno Camon X Pro meets the specifications without any doubt. Every shot is sharp, bright, and awesome. The in-built ring flash maintains the brightness and lighting of the images captured in contrasting environments. Gone are the days of worrying about blurred images captured in motion. With a super PD focus feature, moving objects are excellently tracked to produce sharp images with an increased focus speed of dark scenes. This is a security feature that utilises the quality of the 24MP front camera to recognise your face and grant access to your device. Think of it as a more secure way of protecting your phone against unauthorised access. The front camera conducts a detailed scan of your face to ensure exactness. 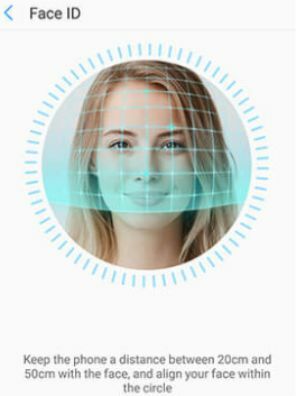 It's quite a simple approach as you can easily set up your Face ID and then position your face between 20cm to 50cm away from the phone while aligning it with the scanning circumference. Another security feature, most users will very much appreciate, is the inbuilt fingerprint sensor or. This hardware component is fitted at the rear and combines excellently with the default lockscreen feature to provide security measures that hinder unauthorised access to your phone. Additionally, this feature can be used to easily perform other operations such as receive calls, record calls, browse photos, capture images, and many others. Just with a finger, you can achieve so much at ease and much faster than conventional ways. If you're sceptical of the Face ID feature, then this is a better alternative, not only for ensuring and boosting security, but to increase the speed of performing some operations with your phone, also. The design of this amazing device delivers firmness, composure and comfort while maintaining portability. At 5.2mm thick, your hand can easily and firmly grasp the device without stress, or fear of it falling frequently. Though it's 6 inches long, the 75.3 mm width nicely allows one-hand operation, at the minimum. It features slightly curved edges with striking reflections to expose glittering materials and perfectly fitted tiny colour-variant bands at the sides and top of the rear that exhumes beauty and magnifies the user-based processing technology adopted by Tecno. The glitters by the sides and edges become glaring under the strikes of rays or beam of light. Storage capacity is one of the top smartphone features sought for when purchasing a phone. Tecno performed up to expectation on both the RAM and ROM of Camon X Pro. The RAM which contributes to other factors to dictate the speed of operation is indeed of unrivalled size. At 4GB, the processor has all the available space to respond to instructions and manage processing needs at a faster rate. On the hand, the internal storage which is available for you to store files, documents and install your apps is of substantial value. Whether you want to store seasonal movies, install high-weight apps, save ebooks, music, voice or video recordings, and photos, the 64GB ROM has that covered. If this still appears to be insufficient, an external micro-SD card is fully supported to 128 GB. It's indeed an unrivalled storage size to conveniently store all your files, documents, music, photos, and install your favourite apps. Nicely built to run on Tecno's customised HiOS based on Android 8.1 Oreo, Tecno Camon X Pro enters the market as one of the first smartphones to run on this fully optimised mobile OS. New technological inputs into the development of Android Oreo has focused on increasing the speed of operation, managing available storage sizes, improving security and ensuring the durability of smartphones. This OS ships with its cool features such as Play Pay, Google Play Protect, Fingerprint support, better Emojis, smarter graphics, tooltips, and efficient battery management, that ensure users get the very best excitement and satisfaction from using supported devices. Not only does Tecno Camon X Pro boost of an OS with excellent power management features, it equally integrates a 3750mAh battery that powers your device to perform daily tasks without disappointment. Feel secure to play games, browse the internet, socialise your favourite social media, watch videos, play music, and make calls as often as you like. Charging is not a headache as it fully supports fast charge within 10 minutes. Background apps are controlled automatically to prevent unnecessary power consumption. At the same time, power-consuming applications are optimised to deliver a lasting experience. Though a number of features and components combine to determine the processing speed of a mobile, the type and capacity of the processor top the lists. 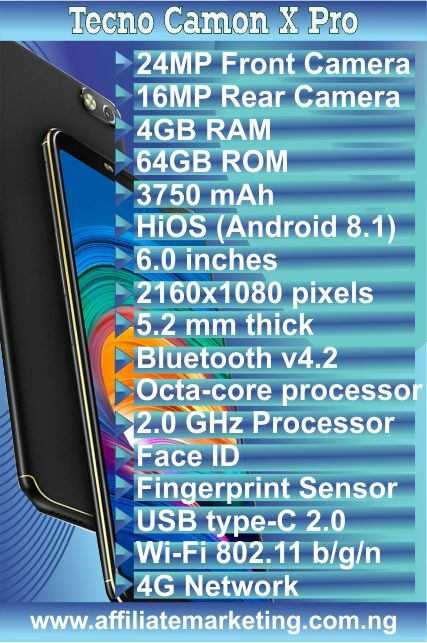 This device is perfectly built on MediaTek MT6763 Chipset Octa-core Processor operating at a speed of 2GHz. This grants it the ability to handle instructions at an amazing speed, thus eradicating freezing and delays. Combining with the 4G RAM makes the performance intriguing. For gamers in search of quality graphics, higher definition display, sizeable resolution to launch 3D games, this device is a perfect match for you. The 6.0 inches screen stretches to the very edges of the phone's frame, leaving just a small bezel beside the screen. The 18:9 display ratio guarantees the tremendous visual experience any user would demand. The wide 2160x1080 display resolution fully accommodates all visual sizes for browsing websites, playing games, and performing other high-visual functions. 24 MP front camera with dual flash. Face ID support and a rear Fingerprint sensor. 16 inches display screen and a slim body size at a thickness of 5.2 mm. 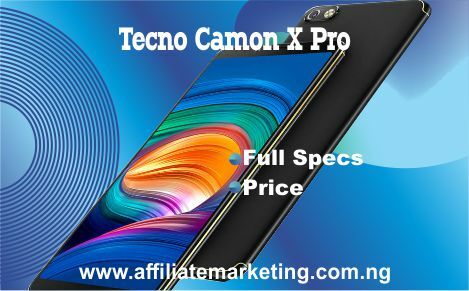 The price of Tecno Camon X pro is yet to be announced but it is rumoured to be available at $208.62 (₦75000) to $222.53 (₦80000). You can pre-order for now. Once it is fully available, popular online malls and local shops will be up to graze this device.